A bubble-bath necklace? A DNA vending machine? A hat made out of golden fleece? Read Guardian’s review of ‪#‎WhatisLuxury‬? Together with the Crafts Council UK V&A presents, highlights and challenges ideas of luxury. Try to imagine a hat made out of golden fleece, a fleece very like the one that Jason brought back from Colchis. The gold has been spun into the finest of threads, one-fifth of a human hair in diameter, before being woven and braided into a close-fitting cap that looks as if it belongs to a particularly flashy Cossack. The cap itself is magnificent, but it is the rim that makes it mythological. Constructed from short strands of golden wire, the effect is a pelt of fiery fur. It took Italian metallurgist-artist Giovanni Corvaja 10 years to develop the techniques that persuaded 1.5kg of gold to do his bidding, to bend without breaking. Then it took him another two years, working 80 hours a week, to weave and braid the hat itself, which is modelled on one of Peter the Great’s crowns. Such a tally of obsessive labour and precious raw materials makes the hat priceless, in the sense that no amount of money can recoup its cost. And since it is made not for wearing but for looking at, it is, strictly speaking, pointless, too. The golden fleece hat is just one of the many remarkable 100 or so objects in What Is Luxury?, the V&A’s new exhibition. Previewing the show earlier this year, Time Out ventured that it would be “blingtastic”, which implied that the V&A was intending to turn the Porter Gallery into an airport shopping mall, complete with “It” bags, cashmere golfing jumpers and giant Toblerones. It was an unhelpful description, although you can see how the confusion arose. “Luxury” has become such a shopsoiled term in recent years that it is impossible to hear it without thinking of feverish, indiscriminate consumption, like Bicester Village retail park on a humid bank holiday. But this is the V&A, not an advertorial in a Condé Nast magazine, and the question mark at the end of What Is Luxury? is key. “We want visitors to be nudged into thinking about what luxury means as a category and what it means to them personally,” explains co-curator Jana Scholze, who points out that the show opens with a list of one-word prompts, from “authenticity” to “privacy” to “expertise”. “Bling” is not a term on offer, which is hardly surprising, given that the show is mounted in conjunction with the Crafts Council. Craft, indeed, runs as a theme and counterpoint throughout the show, sharpening definitions of luxury by functioning as both its prop and its foil. Take the golden hat. At first glance, it seems intended as a piece of conceptual artwork, designed to provoke thoughts about the relationship between opulence and luxury, function and decoration, use and excess. And yet, to make the object, Corvaja drew on years of training with goldsmiths in his native Padua, near Venice. It was what he learned there, as well as at London’s Royal College of Art, that enabled him to develop the means of spinning and weaving this raw metal. Golden Fleece Hat may have started as a piece of speculative – in all senses – art, but it reveals itself on further examination to be a product of a craft tradition that stretches back to the master goldsmiths of Etruscan Italy. These contrasts are similarly alive in Joris Laarman’s Positive Mould Bone Chaise. This is part of a range of furniture designed using a computer program developed by a German car manufacturer. The placement and size of the chaise’s branching struts have been made to mimic the growth patterns of bone. Just as in the self-repairing human body, material is added only where needed, and thinned or removed where it is surplus to requirements. 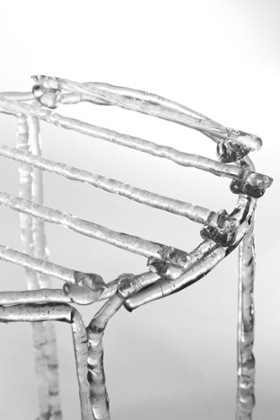 By showing the mould, rather than the finished object, the focus is on the human interventions that are still necessary in a world of apparently seamless computer-generated design. Meanwhile, the fact that the chaise is patterned on natural bone growth triggers the rueful recognition that the greatest luxury any of us might wish for is a body at the peak of its regenerative powers. This business of whether it is materials, design, labour or a contextual backstory that makes a particular object luxurious is buoyantly at play in Nora Fok’s Bubble Bath. 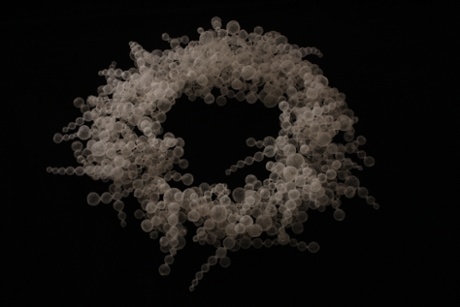 Fok has made a necklace out of the froth of a thousand “bubbles”, each of which she has knitted from nylon microfilament. The finished piece gives a permanent form to the transient bubbles, yet replaces one utilitarian material (fishing line) with another (soapy water). Hanging the extravagantly frothy necklace around the neck makes the wearer look as though she is soaking in a bubble bath, indulging in that most mundane yet precious of luxuries, time to oneself. And then, just at the point where the exhibition might seem to be getting a bit emperor’s new clothes, comes Monkey Business. This is the name of a piece by Studio Job, and could be interpreted as a homage to those creepy bibelots that people used to bring back from India after a lifetime of serving the Raj. The shimmering sculpture comprises a brilliant Swarovski crystal-covered monkey straddling a gilded bronze treasure chest. Its possible meanings are endless: the monkey may be in charge, although the fez on his head suggests that he is a captive performer. In any case, is he guarding the treasure or stealing it and, given the title, can we even be sure that this loot is legal? And, finally, what are the chances that the monkey, universal symbol of the trickster, is simply laughing at us for getting so abstracted about the whole vexed question of what, exactly, luxury is for? Gunpowder Diamond, Shane Mecklenburger, 2012. Actually, on this last point, the monkey would be a beat behind. For over the last decade, luxury has become a pressing object of inquiry for economists and historians, as well as those working at the sharp end in Bond Street. Economists want to know why Europe’s luxury goods industries have done so well throughout the recent recession. The emergence of a super-rich class in China, Russia and Brazil will take you so far, but it is the extraordinary resilience of homegrown desire for the rare and the beautiful that has been the gratifying surprise. Historians, meanwhile, have been paying attention to the way the exchange of luxury goods has been used in all eras to bolster dynastic ties, cement political alliances and broker new national identities. There’s even a Leverhulme-funded Luxury Network, which brings together academics, curators and business people to explore what it calls, with chilly clarity, the “manipulation of desire”. The second half of the exhibition is dedicated to teasing and harrying at the limits of its guiding question. So while the first room features two intricate handcrafted mechanical watches by the renowned British horologist George Daniels, the renowned British horologist, the second has Marcin Rusak’s (in collaboration with Iona Inglesby) Time for Yourself, a toolkit that celebrates the pleasure of being off the clock. The kit contains a watch with no hands, an inkless pen and a compass that spins at random, a reminder that, in an age of ubiquitous GPS, losing oneself has become a kind of indulgence, too. With time comes the idea of both past and future, and a concern about their plunder. The Atlas of Gold Fictions catalogues the strange infrastructures of the economy of gold, from one of its sources in the mines of Australia to the web of precious artefacts scattered around the globe. Gold, of course, is technically valueless, dead matter waiting to be ascribed a price by the financial narratives of the stock market. In a neat and poignant reversal, Aram Mooradian has reinscribed gold with new cultural values drawn from the places it was extracted from and the points where it ends up. There’s a gold-plated headphone jack that has been encoded with an Aboriginal songline, and a golden bullet engraved with the lengthy suicide note of Hunter S Thompson. The Rise of the Plasticsmith, Gangjian Cui. Neatly reversing this traffic is the work of Shane Mecklenburger, who creates diamonds out of carbon extracted from waste materials. In his corner of the exhibition, you will find gems fashioned out of a dead armadillo (Texas road kill) and 32 pages of the film script for Superman III. The result is a not-inconsiderable 29 carats-worth of sparkle that illuminates the relationship between the symbolic, aesthetic and market values given to what used to be known, unblushingly, as “a girl’s best friend”. Broadening the geopolitics still further is Gangjian Cui’s installation Rise of the Plasticsmith. He anticipates a time 50 years hence when the scarcity of oil will mean that cities such as his native Daqing, a community in north-east China built entirely on the industrial production of plastic, will be facing terminal decline. The artist posits the rise of a new breed of worker who will use now-precious plastic much as an artisan might: sparingly and with a laser-like focus on the intricacies of each individual piece. To this end, he has developed a set of tables and cabinets constructed entirely out of transparent plastic, using simple joints that have been melted together. The result is delicate, fragile and actually rather beautiful. China is central to another bit of visionary artwork, this time by London-based Studio Swine. Hair Highway sets human hair in resin to create highly decorative pieces of furniture and accessories, including ornaments, vases and the base for a combined mirror and dressing table. The rich surfaces look like highly endangered tortoiseshell, horn or exotic wood, yet are made of one of the few natural resources that is actually on the up. Chinese hair is particularly good in this regard, and an accompanying video shows a Shandong hair market in full bustle as swishy plaits and ponytails change hands for cash. And if the idea of wearing or using something made of someone else’s hair seems creepy, the duo behind Studio Swine ask us to remember that silk comes from insects and wool from sheep. All it takes, they suggest, is an effort of will to think about human hair in a similarly pragmatic way. But is it really a good idea to give away bits of yourself in such a shoulder-shrugging manner? 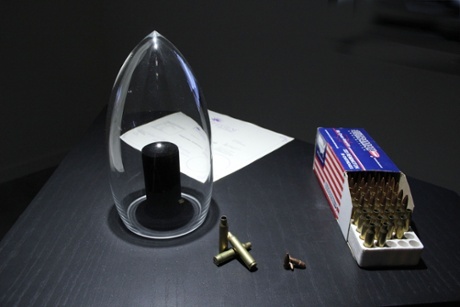 American artist Gabriel Barcia-Colombo thinks not. He points out that the Supreme Court has already ruled that US citizens do not own the commercial rights to their discarded skin flakes and spittle: technically, anyone may do anything with your genetic bits and pieces. To shock us into considering the full implications, Barcia-Colombo’s DNA Vending Machine contains pre-packaged DNA samples, harvested with consent from his friends. Customers put their money in the slot, choose an anonymously packaged sample and, once they have it in their hands, can turn it over to see a photograph of the donor. What exactly they want the sample for – to grow another human, to catch a criminal, to sell to a pharmaceutical company? – is never made clear. And although visitors to the V&A will not be able to operate the machine for themselves, the installation invites them to consider the pleasures and perils of our increasing access to biotechnology. In the near future, suggests Barcia-Colombo, the greatest luxury of all, available only to the super-rich and professionally paranoid, may turn out to be the right not to turn yourself into a personal franchise. Being you, and only you, will be the biggest bling of all. • What Is Luxury? is at the V&A, London SW7, from 25 April to 27 September.